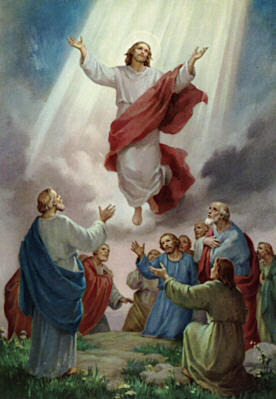 "He ascended into heaven and is seated at the right hand of the Father." The Ascension is a mystery of faith, just like Jesus' Resurrection, with which it is closely associated. The event is mentioned briefly by the Evangelist Mark (16:19) and Luke (24:50-53). A more detailed account is given by Luke in the Acts of the Apostles (1:1-12). The Ascension of Jesus can be defined as the transfer of his risen, glorious body to heaven, that is, to the world of the divine. In the Old Testament, God is described in some texts as "descending" from heaven to accomplish something on earth; he then "ascends" or returns to the world of the divine. Jesus himself speaks of descending to this earth and ascending again to the Father once his work of redemption has been accomplished (cf. Jn 3:13, Eph 4:10). are two aspects of the same thing. Through his Resurrection-Ascension, he leaves the earth and the created universe to take his place at the right hand of the Father.